I wasn’t planning on posting this recipe as it certainly isn’t the best for you. However, after sharing the cake with others I received several requests for the recipe. So with a few modifications this recipes has a least been a little “healthified.” Otherwise, it’s just plain good and deserves to be enjoyed in moderation. In a large bowl, beat the cake mix, egg, oil and applesauce on low speed until combined. Press into a 13-in. x 9-in. baking pan coated with cooking spray. In a another large bowl, beat cream cheese and peanut butter until smooth. Add the butter, eggs, egg whites and vanilla; beat on low until combined. Add the confectioners’ sugar; mix well. Pour over crust. Bake at 350° for 40-45 minutes or until edges are golden brown. Cool on a wire rack for 20 minutes before cutting. Refrigerate leftovers. Yield: 24 servings. Nutritional Facts 1 piece equals 228 calories, 11 g fat (4 g saturated fat), 38 mg cholesterol, 255 mg sodium, 29 g carbohydrate, 1 g fiber, 4 g protein. 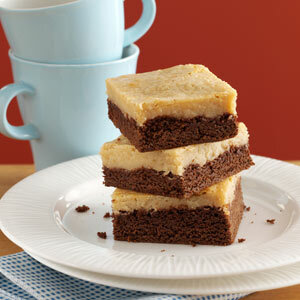 This entry was posted in Brownies, Cake, Dessert, Peanut Butter by seboisen. Bookmark the permalink.